Sen. Jeff Sessions (R-AL) is echoing the concerns of other prominent conservatives that the events unfolding now in Washington could lead to mass amnesty in 2017. After the failed 2006-2007 amnesty push, the immigration lobby spent $1.5 billion leading up to the 2013 push in which Sen. Marco Rubio (R-FL) delivered a bill to allow even more foreign workers. A recent PBS documentary exposed how Ryan and Rubio were nearly successful in their effort to pass amnesty in 2014. Ryan had crafted a bill and had the Republican votes necessary to pass it. 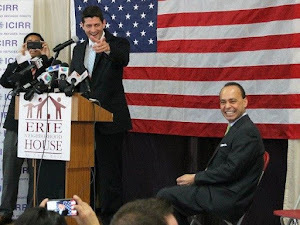 Ryan’s amnesty effort was aided by many of the members of the House Freedom Caucus, including Rep. Mick Mulvaney (R-SC) and Rep. Raul Labrador (R-ID). Mulvaney has since become one of the biggest boosters in the House Freedom Caucus of a Paul Ryan Speakership. According to the documentary, the Ryan-Rubio amnesty plan was foiled when Rep. Dave Brat (R-VA) scored a historic primary victory to oust then-House Majority Leader Eric Cantor. As Breitbart News has previously documented, Ryan has a long history of promoting open borders immigration and trade policies. More than 9 in 10 Republican voters oppose the Ryan-Rubio immigration agenda. According to Pew, at least 93 percent of Republican voters want to see immigration into the United States leveled or slashed, rather than continue to grow. Sessions is referring to the Obama-backed immigration bill Senator Rubio co-authored and ushered through the Senate. As Breitbart News has reported and Politico recently confirmed, Rubio has not backed away from a single policy item outlined in the mass amnesty bill. Under our current immigration policy, every day the United States brings in enough immigrants to fill a large high school. Since Marco Rubio came into office, the United States has imported an immigrant population that four times the population of Manhattan. Since Wisconsin voters sent Paul Ryan to Washington, the United States has brought in a population that is nearly triple the size of the population of their state. Yet under the Ryan-Rubio vision for a New American Century, those numbers would be even larger. After nearly half a century of massive immigration it is time to turn our attention to our own residents. It is time to help our own workers, families and communities — immigrant and U.S.-born — rise together into the middle class. We need an immigration policy that shows compassion for Americans. Anyone running for the White House who cannot publicly commit to these principles should consider a different occupation. Americans should no longer have to wonder for whom their leaders work.